Are you ready for a parade? Vesterheim welcomes you to our Syttende Mai celebration! 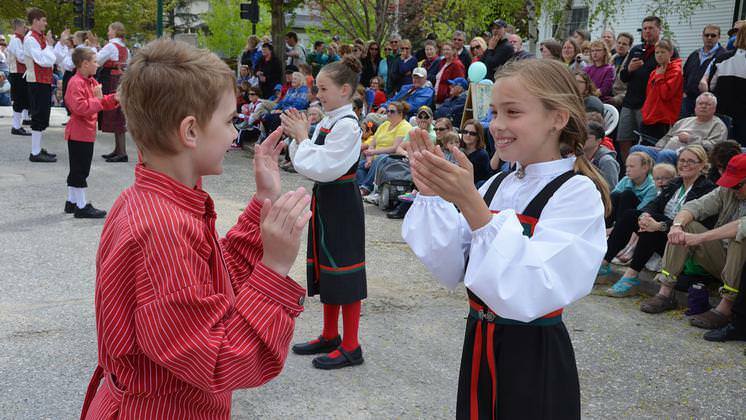 Come for a traditional Children’s Parade, a performance by Decorah’s Nordic Dancers, and other activities. 10:30 a.m. – Heritage Park guided tour (12 historic buildings in Vesterheim’s campus). 12:00 p.m. – Children’s Parade from the Winneshiek County Courthouse to Vesterheim. Gather in front of the courthouse at 11:45 a.m.
12:30 p.m. – Decorah’s Nordic Dancers will perform on Mill St., next to the museum’s Main Building directly following the parade. 1:30 p.m. – Heritage Park guided tour (12 historic buildings in Vesterheim’s campus). The museum and store will be open from 9:00 a.m.-5:00 p.m. There will be free admission all day. Syttende Mai is the day Norway ratified its constitution in 1814 at Eidsvoll. Now, Norwegians celebrate their constitution with excited crowds, especially children, marching through the streets waving flags, singing songs, and celebrating their nation’s independence. Syttende Mai is a great opportunity to celebrate freedom wherever it occurs. In case of inclement weather, the parade and Nordic Dancers will be canceled. Find an album of pictures from the 2018 celebration on our blog here. Syttende Mai is sponsored by Jeff and Marilyn Roverud and Sons of Norway Decorah Lodge.